Corsair recently revealed two concept PC systems and a range of innovative new technologies, leading the way for the next generation of CORSAIR products. 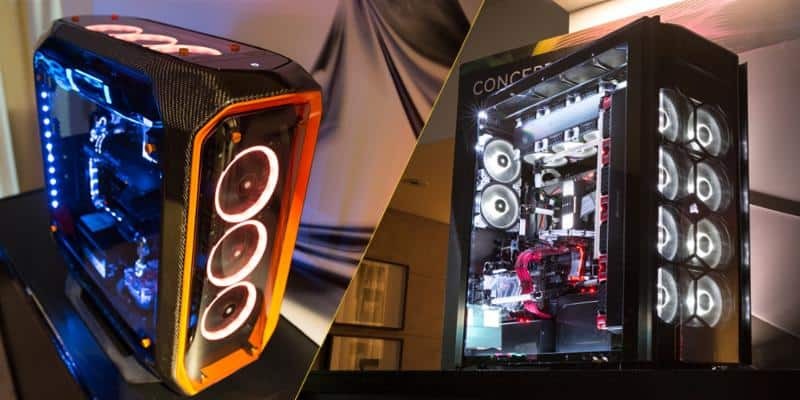 Unveiling Concept Slate, Concept Curve and a host of new RGB lighting and liquid cooling demos on its suite at The Grand Hyatt Hotel, Taipei, CORSAIR continues more than 20 years of innovation for PC builders, gamers and enthusiasts, helping them build their PC’s better. Concept Curve re-imagines the iconic CORSAIR Graphite 780T in stunning hand-finished carbon fiber and beautiful curved tempered glass, with a dynamic automotive look trimmed in orange and finished with mesmerizing prototype RGB fans. Multiple pieces of curved tempered glass encase Concept Curve, offering unimpeded visuals of the stunning liquid-cooled system within. Redefining the use of luxury materials in a PC, Concept Curve has the looks, finish and feel to match the most outlandish of super cars. Concept Slate is the future of the super-tower PC, designed for maximum system support and clad in stark sheets of smoked tempered glass, it represents the peak of what’s possible with a performance PC. Boasting massive water-cooling and dual-system hardware support, Concept Slate’s radically designed interior makes building and displaying the world’s most powerful PCs easier than ever, all with the best in fan and RGB lighting control built it. Boasting not one, but two fully water-cooled systems within its monolithic frame, Concept Slate is epic in design, scale and ability. Alongside Concept Slate and Concept Curve, CORSAIR is proud to unveil SYNC IT, a COMPUTEX exclusive demo unifying DIY, peripheral and motherboard RGB lighting for complete RGB synchronization. For the first time, users can coordinate RGB lighting between CORSAIR RGB case fans, Hydro Series CPU coolers, light strips, keyboards, mice, mouse pads, headsets, and with the help and support of MSI, select motherboards. Synchronize every component’s lighting with just one click in just one piece of software, or watch as dazzling reactive lighting effects spread and flash from keyboard to mouse, system fans and even the MSI motherboard. RGB will never be the same. CORSAIR has been at the heart of enthusiast liquid cooling for years, and COMPUTEX 2017 offers a glimpse into the future with the unveiling of two revolutionary new advances. New prototype RGB Hydro Series liquid CPU coolers push style, performance and finish to the next level, combining a sandblasted aluminum pump head with beautiful 360° RGB lighting, magnetic levitation fans and a quieter, more efficient pump. For those who strive for the absolute best in liquid cooling, CORSAIR is also proud to unveil its new performance custom liquid cooling water blocks, fittings and radiators. Cooling the CPUs and graphics cards of both Concept Slate and Concept Curve, the stunning nickel and copper water-cooling blocks, chromed fittings and efficient radiators are the first look at CORSAIR’s upcoming custom liquid cooling line-up, carrying the trademark CORSAIR commitment to quality, design and performance. This is my first visit here. I have bookmarked this site to visit again in the future. Very good writing. Keep posting..